In the 'Golden Era' of Australian motorsport, the exciting six-cylinder XU-1s dared the unthinkable - competing against 351ci V8 race machines. Back in the 1960s, huge capacity V8-powered monsters the dominated Australian Touring Car racing scene. The 'big three' (Ford, Holden and Chrysler) were the main players, but when Ford introduced the formidable GTHO Falcon, the opposition knew it needed a new approach. 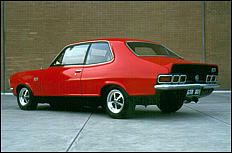 The big Monaro coupe had been Holden's loyal performance king for many years, however the humble Vauxhall Viva (marketed by Holden) had also competed in the smaller-capacity categories with very little recognition. It was eventually to become the unlikely giant killer. 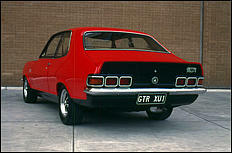 The original Viva design was adopted by Holden in May 1967 and re-released as the HB Torana. The name 'Torana' is an aboriginal word meaning 'to fly'. It hit the Australian streets powered by the Vauxhall-derived 1159cc four, which produced a meagre 56hp. It was a sold as a commuter car, nothing more. However it packed coil spring suspension all 'round, a rear sway bar and a 4-link rear end. It also used direct feeling rack and pinion steering to guide the 2-door only body design. Its styling was commonly described as a "contemporary hippie design", and it showed its Euro heritage quite strongly. For example, the rear numberplate illumination comprised twin bulbs that were originally designed to light up the wider UK plates. In late '67 the first 'hot' Torana debuted in the form of the Brabham special. Named after the legendary Australian race driver, the car received twin Stromberg carburettors and a 9.0:1CR amongst other small changes, lifting the power output to 79hp. Other technical changes were a pair of power-assisted front disc brakes, wider wheels, a lower diff ratio and garish GT stripes with Brabham stickers. Then in early 1968, the Series 70 was added, using an upgraded version of the original engine design to make 69hp with a 9.0:1 compression ratio. It too used power front discs, 4-inch wide wheels and distinguishing '70' and chequered-square stickers. The second series of HB was born in September 1968, including the all-Australian designed 4-door version. It received a single numberplate light, collapsible steering column and recessed sports instruments. The car developed quite a cult following in the performance market and Holden decided to take matters further. Still using the basic Vauxhall chassis design, the radically different LC model Torana appeared in October 1969, this time powered by an optional Holden six-cylinder engine. But because the six-cylinder engine was much longer than the four, the nose of the car needed to be extended 4-inches (101mm) to accommodate it. Its elegant new outer body almost fooled the Australian public into thinking it was a completely different car.... Being a financially sound idea, the drivetrain from the HT Holden was dropped in to give the 1000odd-kg Torana an exceptional power-to-weight ratio. To cope with the extra power and weight, the HB suspension layout was up-rated and revised accordingly. This was the beginning of a genuinely fast car. Shortly after the LC's release, the GTR specification was introduced to the model line up, with its 2600S (161S) six-cylinder and Opel 4-speed gearbox. 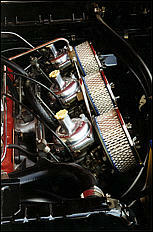 The engine used a single 2-barrel carb, mild cam, performance valve springs and bearings, twin headers and a 9.2:1 CR. The result was 125hp (93kW) at 4800rpm and 150ft-lb (248Nm) at 2800revs. High revs weren't where the Holden six excelled. The car came as a 2-door only and was fitted with bigger 10-inch front discs, rear drums, sports suspension and full instrumentation. The choice of body colours was also something to behold - they were very, very bright! The body received more attitude with guard louvres, stripes and wider sports wheels. It weighed around 1012kg - a full 200kg heavier than the four cylinder variants. It was such a dynamic package that the New South Wales police adopted it as one of their official pursuit cars! Not only that, it was a huge success in the Australian rally championship. Hankering for still more power, the engine capacity of the XU-1 was bumped up to 186ci (3048cc) and the induction system went exotic. 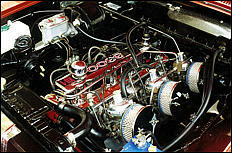 No less than three 1.50 inch CD Stromberg side-drafts were mated onto a new tuned length intake manifold while a set of sports air cleaners gave it an inspiring howl. A high 10.0:1 CR was adopted and there were minor revisions made to the cylinder head and cam. 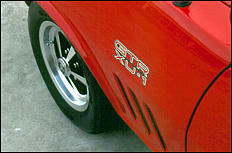 Larger valves were also fitted and a 2-inch exhaust system let the engine breathe more easily. An impressive 160hp was made at 5200rpm while 190ft-lb (258Nm) of torque was developed at 3600rpm. Braking performance was stepped up with ex-Monaro thicker discs, different calipers and a tandem booster system. Other improvements were an LSD, bigger fuel tank, front air dam and rear spoiler along with a mild decal kit. Interestingly, the front air dam also deflected air onto the front discs. Weighing in at about 1102kg, the car had a 147 hp/ton power-to-weight ratio, while the rival Ford GTHO Falcon made a conservatively rated 300hp to achieve a 204 hp/ton ratio. Such a huge power difference handicapped the Torana on the circuit (especially the tough Bathurst track) but the car was always hot on the Falcon's heels on the tight, twisty tracks. More power would inevitably be needed if it were to win a championship. The new performance car were advertised heavily using a "When you're hot, you're hot" theme that ensured the cars were sold virtually as soon as they were out of the factory's doors. Only 1633 LC GTR XU-1s were made. 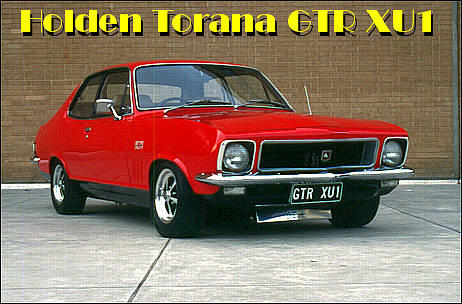 In mid 1971, the six-cylinder powered Toranas were upgraded to HQ Holden mechanical specs, replacing the 2600 (173ci) engine with a 2850 (186ci) version. An Australian built M21 gearbox also replaced the Opel unit. The GTR versions swallowed the 2850 engine instead of the 2600, while the XU-1 also sported a bigger 17-gallon fuel tank, 13 x 5½ wheels and a GTR steering wheel. The last of the 'Coke bottle' GTRs was the LJ model, which was available new from February 1972 - March 1974. The LJ shared a considerable amount of componentry with the HQ, with adjustable head restraints, a derived steering wheel column and 10-inch wheel. 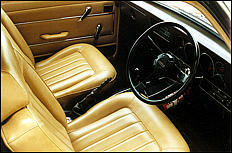 Better seats were fitted, and its dashboard was also revised with some relocation of minor controls. 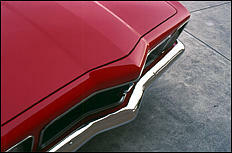 Externally it received 3 piece tail light assemblies, different headlight surrounds and a different grille. All GTR-spec cars were endowed with a stroked version of the same 6-cylinder engine, displacing 202ci (3300cc). Improved flexibility and torque was the main motivation for this change. The XU-1 got three 1.75inch CD Strombergs plus further cam mods and a high-as-could-go 10.25:1 compression ratio to make 190hp (142kW)! This power level was achieved at 5600rpm while peak torque was 200ft-lb (271Nm) at 4000rpm. For added durability, it had a beefier block, pistons and head casting. In the end, the engine was a bit a "lumpy and grumpy" as it cammed over and demanded an accurate tuning of its multiple carburettors. Some on-going changes were made to the XU-1 in late '72, the most relevant being the switch to 13 x 6 alloy Globe Sprintmaster wheels. Even this 'ultimate' version GTR XU-1 retailed for only around $3350... And obviously it had the goods - the car managed 0-60mph in 7.9 seconds and covered the quarter mile in a respectable 16.4 (depending on diff gears). However, the rival Falcon GTHOs could roar over the quarter in high-14s! Top speed for the XU-1 was an estimated 130mph, which was almost as quick as the 1667 units were sold to the public. On the circuit the new more-powerful Torana shone, winning many of its races with a 1-2 or 1-3 victory. The car proved extremely reliable and had generally more endurance than the Falcons. In 1972 the Torana won a rain-soaked Bathurst under the guidance of Peter Brock. This was to be the GTR XU-1's last full year of Touring Car Racing, but it did take out the Australian Touring Car Championship in 1974, even although the all-new LH V8 Torana finished off the closing rounds. Holden suddenly lost enthusiasm with their performance sixes in late 1974, turning its motorsport development resources to the V8-powered SL/R 5000 LH Toranas. Abandoned, the Viva-based design was reduced to a 59kW shadow of its former self, called the TA Torana. What is reputed to have killed the racing GTR, is the widely despised 'Supercar scare' of the time. Word quickly spread about the almost ready to go V8-powered XU-2, and it wasn't greeted well. The media got a lot of mileage from the imminent release of these 160mph Supercars that were to terrorise public roads. With hindsight, this may have been a blessing - the cars were fairly unsophisticated in their brakes and suspension. Yes, a '70s classic' is the best way to describe the charming XU-1.